For smooth and nourished legs: Just smoothly rub the soap on wet skin until lather builds up. Shave and rinse with water. The shaving soap is especially nourishing because of hydrating ingredients and is therefore suitable for dry skin as well. It contains organic fair-trade shea butter. The cardboard box is biodegradable and doesn't produce any excess waste. If you like, try shaving with a metal razor for a fully plastic-free shave. Hand-made in the Lamazuna Workshop in Chevreuse valley, France. Inci: Sodium Cocoyl Isethionate, Butyrospermum parkii (Shea) Butter *, Stearic Acid, Palmitic Acid, Aqua/Water/Wasser, Kaolin, Caprylyl/Capryl Glucoside, Lauryl Glucoside, Duftstoffe/fragrance, Montmorillonit, Illit, Tocopherol, Helianthus annuus (sunflower) seed oil. Our seven solid shampoos are perfectly eqipped to minister any type of hair and comes with various scents. Using solid shampoo is as easy as washing your hands: Foam it up in your wet hands or soaked hair and massage into your hair. Since they are solid, our shampoos make a comfortable travel companion and will not get you in trouble, if carried in the carry-on luggage at the airport. It lasts about twice as long as store-bought liquid shampoo. Also, with its' fully bio-degradable cardboard box, it helps cutting down on plastic trash. All Lamazuna Products are made in our own cosmetic workshop in chevreuse valley. 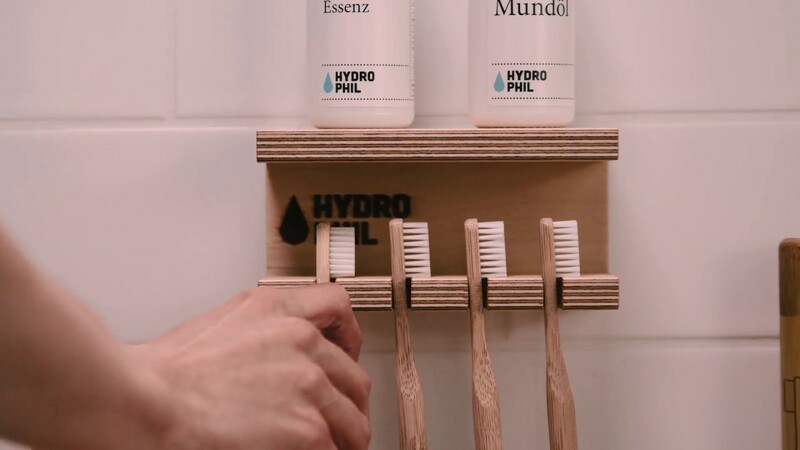 HYDROPHIL, the market leader for sustainable bamboo toothbrushes in German-speaking countries, continues to pursue its ecological mission. Lamazuna is the sustainable French forger for exquisite cosmetics and hygiene products. Their concept: back to the origins, off the common cosmetics industry and always with the preservation of environment in mind. Hey we’re TIO! A brand from Berlin founded by Benjamin Beck and Fabian Ghoshal. The two founders have made it their business to combine sustainability with minimalistic design. The focus of the start-up lays on the continuous development of their products combining innovative ways of avoiding waste.